and a pair of glasses for Granny plus the modifications to make Little Red Riding Mouse's cape and also instructions for her basket. Special notes: I worked with a 3.75mm hook and worsted weight yarn. Have any questions or if you come across a mistake in the pattern please leave a message in the comment section below. SHAWL: *for the first stitch only of rows 3-5 you will start with the 3rd st from the hook. 6) ch 3 and turn, starting with the 4th st from the hook, sc then crochet 2tog then ch3 and sc into next st then crochet 2tog. Repeat this sequence across then sl st the very last st of the row. Refer to the video if this row is confusing. f/o and weave yarn tails in. *I wish I had gold colored wire but I don't so the end result you see is the glasses wrapped in gold metalic thread. I used fabric tac as I wrapped the wire to keep the thread in place. This was the closest match I could get to the gold chain. And I found the gold color stood out more than the silver color. Cut about 8 inches of wire, this will be way more than needed but it's easier to work with a longer piece. Start about 3or so inches in from one end and wrap around a pencil to make a loop, wrap it so the stem of the glasses sits on the outside of the loop. If this is confusing refer to the video. Now make a loop on the other side. There should be about 1 inch in between the 2 loops. Bend the middle that sits on the nose just a bit to give it some shape. Trim up the excess length from each end and then round off the 2 ends of the wire as pictured, try to get the bent end to touch the wire when you round it so there's no gap and it won't catch any stuffing when inside Granny's face. Now bend the ends inward so when placed on Granny's nose the ends will slip into a stitch on either side of Granny's nose/face. You can add a chain as pictured or leave them without a chain. The other thing to consider is whether or not you will keep these removable. If not then you can add a few stitches of thread to keep them on the nose. 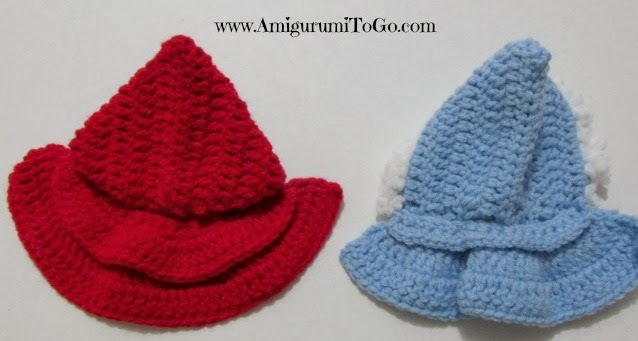 I keep mine removable so that the Wolf can wear them when he tries to trick Little Red Riding Mouse into thinking he is Granny.. (Wolf pattern not released yet). 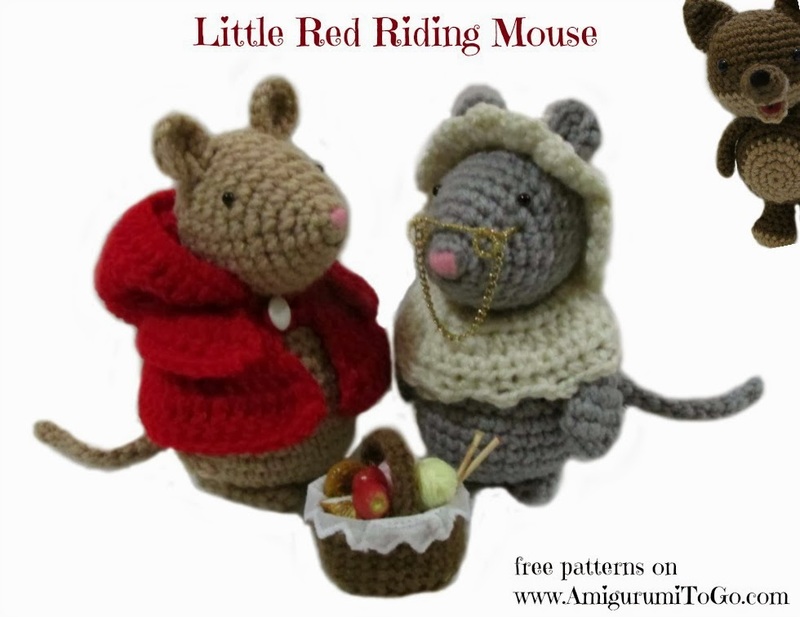 Red Riding Mouse's cape and back collar are longer than the regular cape so we just have to add a couple rows. The hood is exactly the same so I won't re-write the entire pattern but I will write out the cape and collar parts for you so you don't have to flip back and forth. But please refer to the regular cape pattern and video for pictures and instructions. f/o leaving a long tail for sewing. If you use the plastic mesh sheet, put it in before sewing the handles on. I cut an oval shape from the plastic so the basket would have an oval shape. A round basket would be just fine too. Push the mesh into the bottom of the basket then sew handle ends to the inside edge of basket. Line the basket with lace or piece of thin cloth. Fill the basket with things. 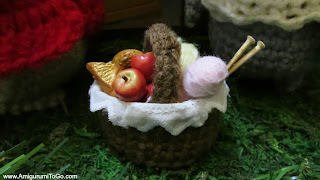 I used some food from my daughter's dollhouse plus I wrapped up embroidery thread and made mini balls of yarn and carved toothpicks for needles. And that's it. 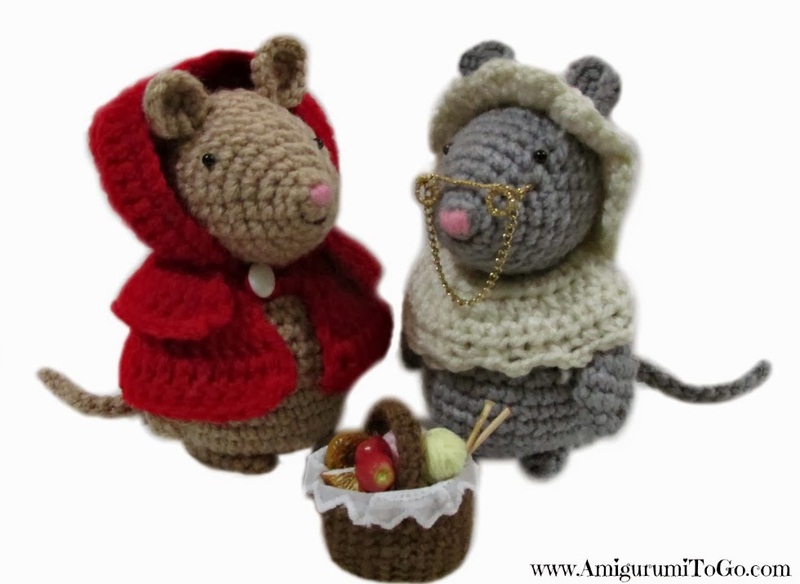 I hope you enjoyed these patterns and remember if you made Granny and Red Riding Mouse please post pictures on my facebook page, Amigurumi Freely I'd love to see! So so so so adorable!!!!! 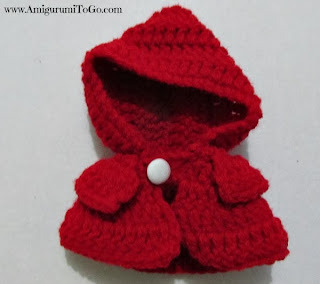 I am currently making the Little Red Riding hood set ~ these are SO Awesome Thank You for making them and the accompanying videos, I am brand new to crochet and it is making following along so simple and fun! Thanks Again. 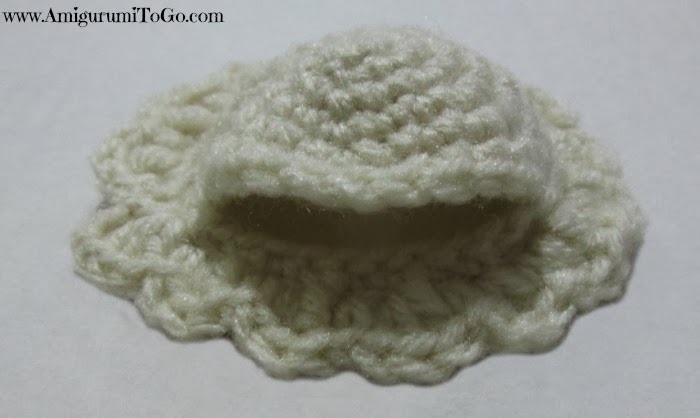 I just wanted to point out under the Shawl written instructions, the first sentence ends with the word "tog" you have accidentally left out the number "2" ~ it should read "2tog" because I am following the video too I understand this and I don't know if a more experienced crocheter would naturally know but as a newby just using the pattern I might have been confused ... It's probably not a big deal but I thought I should point it out to help avoid confusion to other newbys. I'm so happy you are enjoying the videos and patterns, that means so much to me! I'm honored and touched to be able to help during this time in your life. Thank you for sharing that with me, I'm beyond thrilled to know it! 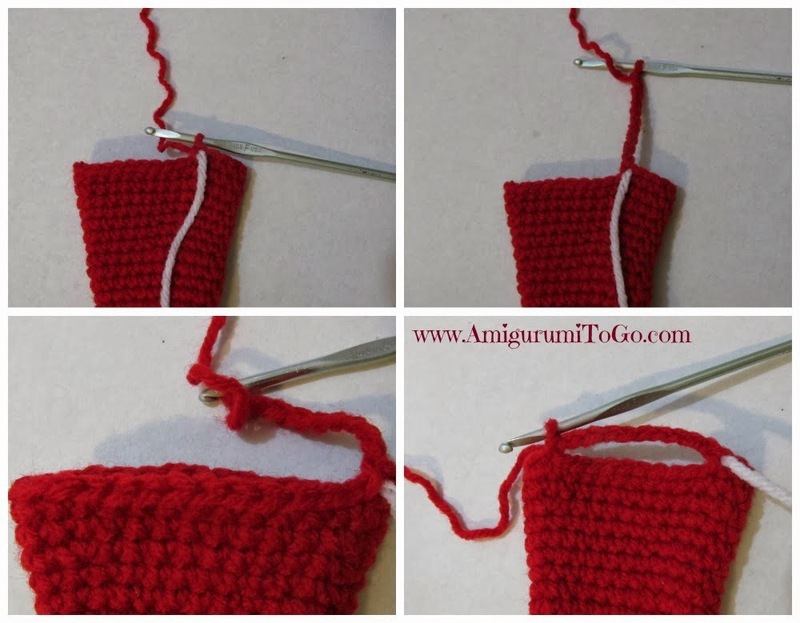 Keep crocheting! Just a note, on round 4 of the back collar for the cape I get a total stitch count of 32 not 36 as stated. Mine came out so cute! I put white trim on cape and call him a Santa mouse. Thanks for the pattern! I'm so glad you enjoyed the pattern and it turned out cute, that makes me happy! I just checked the back collar and the pattern is correct, the number should be 36.
row 4, you should be adding 2dc stitches into every 3rd stitch. You do this sequence 9 times. That means you will be adding an extra stitch to the 4th row 9 times.